Forty-eight more Kentucky elk will eventually be released into Wisconsin forests, but for now those elk are going to be turned out into a 7-acre corral to become acclimated to Wisconsin’s Northwoods. The corral also serves as a quarantine pen – a requirement aimed at keeping diseases from reaching the wild herd. This group of 48 elk represent the last elk that Wisconsin will receive from Kentucky. The elk arrived in the Flambeau River State Forest near the town of Winter in Sawyer County following a 14-hour overnight ride. When the time comes for these elk to be released, they will join more than 200 elk that make up Wisconsin’s northern herd in Ashland, Bayfield, Price, Rusk and Sawyer counties. Wisconsin’s current elk herd began with the release of 25 Michigan elk in the Clam Lake area in 1995. The herd has grown slowly since then, reaching just more than 200 animals (not including the new Jackson County herd) last year. The 48 elk (plus calves yet to be born) that will be released this year, as well as 31 Kentucky elk released here in 2017, will provide a boost to the herd. Wisconsin DNR employees worked with Kentucky Department of Fish and Wildlife Resources employees to move the elk to Wisconsin after the Kentucky crew caught the elk in two days with the use of a helicopter. The U.S. Department of Agriculture-required 120-day quarantine period for health testing began in Kentucky and will finish up in Wisconsin – part of the reason the elk were released into the holding pen. “We are finishing the project with our most efficient and successful capture,” Wallenfang said. 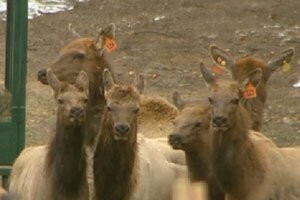 “All 48 elk, most of them female, were captured by helicopter in just two days. Pregnancy testing indicates that most of the adult females are carrying a calf.” Wallenfang also said one of the male elk was a spike bull that weighed more than 525 pounds and carried spikes nearly 36 inches long. Kentucky wildlife workers said its the biggest spike they’ve ever handled. 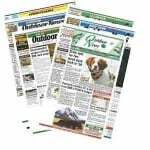 The majority of funding during the final year of the reintroduction project is being provided by the Rocky Mountain Elk Foundation. Based in Missoula, Mont., RMEF has more than 25 chapters in Wisconsin. Since the project’s inception in 2015, contributors have also included the Ho-Chunk Nation, Jackson County Wildlife Fund, the Chippewa tribes and several other agencies, local businesses and individuals.